It’s that time of year. The produce section is looking a little bleak and less bountiful. It’s a whole lot of tubers, root vegetables, and greens. Not that those things are bad… it’s just that I find myself pining for summer things like tomatoes and grilling and frisbee and berries. When my familiar favorites disappear for a few months [or their prices go through the roof], I’ve come to see it as the perfect time to try new foods. What better way to pass the time when it’s freezing outside than in the kitchen? 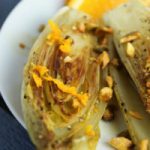 Despite seeing them at Whole Foods plenty of times, I had never bought nor attempted to cook with endives before last week. So I grabbed a few along with a couple of fragrant, juicy-looking navel oranges which are finally in season and are one winter’s few redeeming qualities. Endives are referred to as the “caviar” of the greens and they’re unlike any other food I’ve ever tasted. In Belgium, where they’ve been cultivated for centuries, endives are called “white gold.” They’re grown indoors or underground to protect them from sunlight and to preserve their clean, white color. Just the tips of the plant stick out above the soil, finishing them off with a top-hat of pale green ruffles. One of the best parts about picking out a new food at the store is figuring out what to do with it when you get it home. 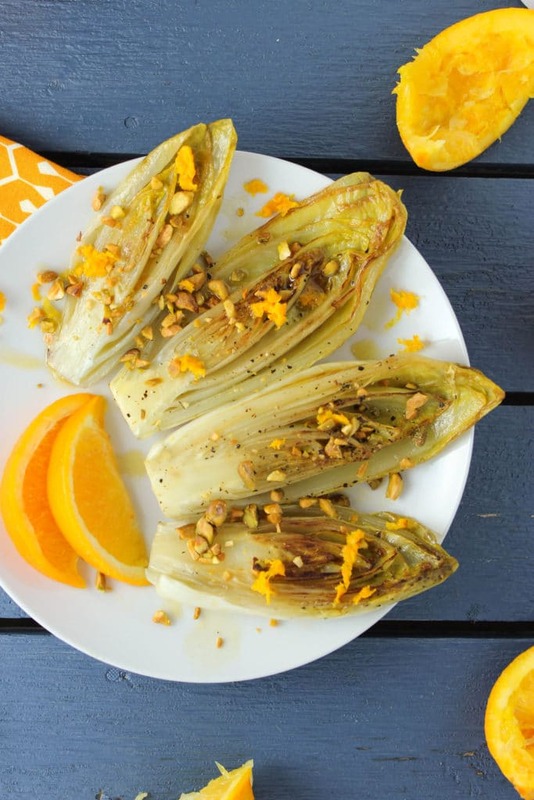 A little research showed that there were approximately 2.3 million ways to eat endives – raw, steamed, pureed, baked – you name it, you can do it with endives. I gathered that when they’re cooked, they become tender and most of their bitterness disappears, leaving behind a light, mildly sweet and nutty flavor. Sign me up. 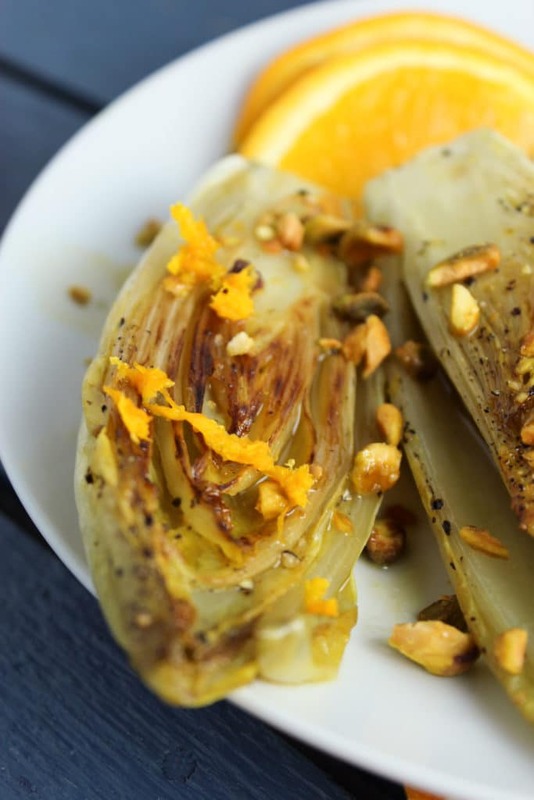 When sliced in half, endives remind me of brussels sprouts, so we cooked them in a similar way. Face down in our beloved cast-iron, the endives got a crisp sear and quick steam all at once. As they cooked, we added in some freshly squeezed orange juice and white wine vinegar. A final sprinkle of crushed pistachios added salty crunch to balance the earthy sweetness. This dish is perfect for brightening up dreary winter days. It’s healthy and fresh-tasting, without being a salad. I don’t know about you all, but I’m still not in the mood for all of this salad-and-smoothie diet resolution business. So I figure cooking healthy greens in a fun and tasty way is a pretty decent middle ground. 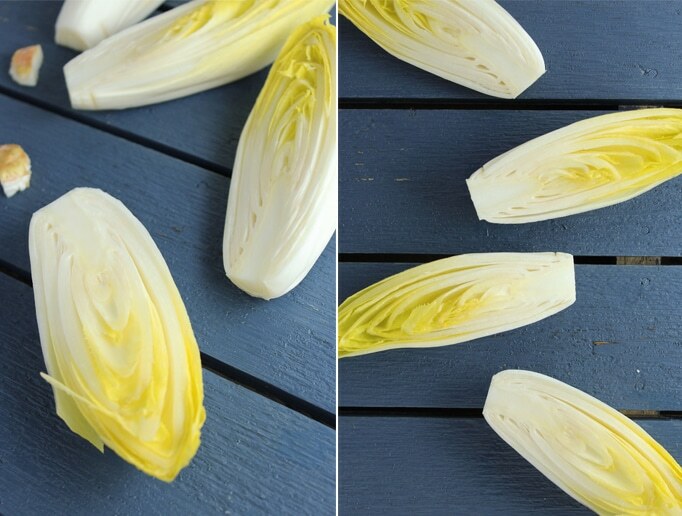 Wash endives and chop off the tough bases of each one, about 3/4″. Be careful not to remove too much – you want to keep the leaves in tact! 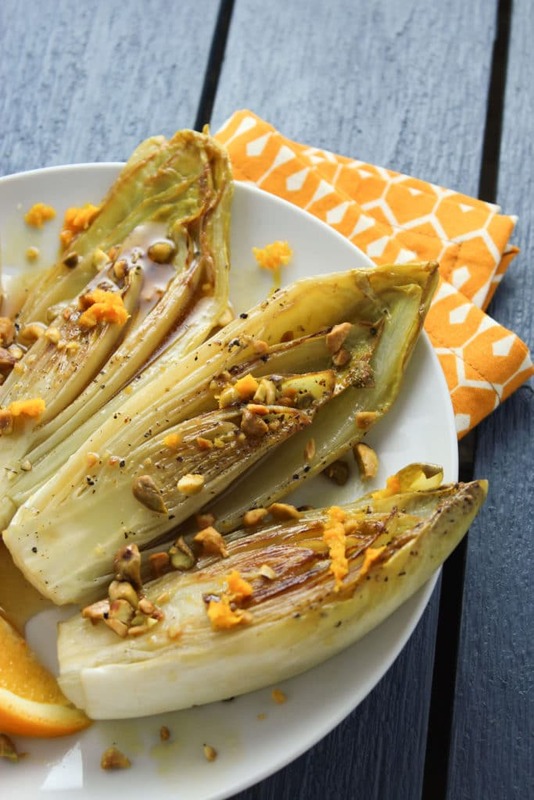 Chop the endives in half vertically. In a small saucepan, heat 1 tablespoon of olive oil on medium. Add about half of 1/3 cup [around 3 tablespoons] of white wine vinegar and stir. Continue stirring occasionally to prevent scorching. Reducing will take 15-20 minutes while the endives cook. In a large cast-iron or non-stick skillet, heat 2 tablespoons of olive oil to medium. Place endives into the pan, cut side facing down. Cook for 5-7 minutes until the cut sides are golden brown and crisping. Add the remaining white wine vinegar and allow it to absorb for 1-2 minutes. 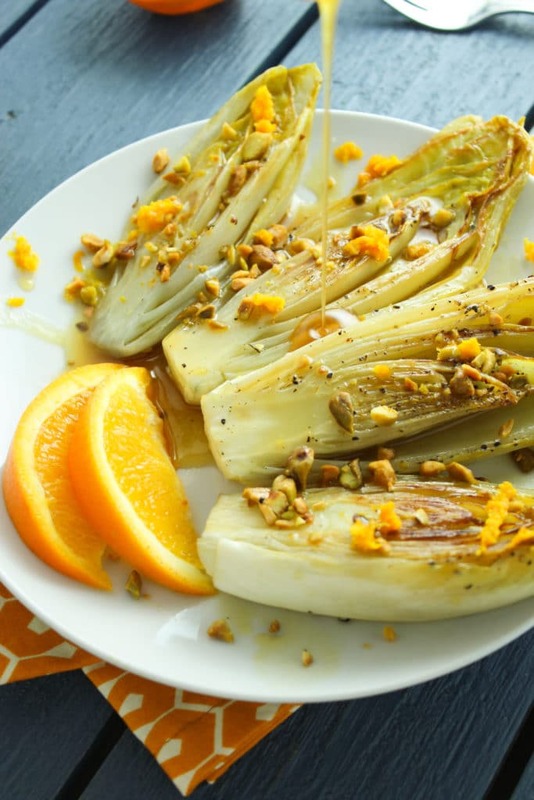 Flip the endives, carefully to keep them from falling apart. Sprinkle with salt and black pepper to your liking. Add half of 1/3 cup of orange juice and cover. 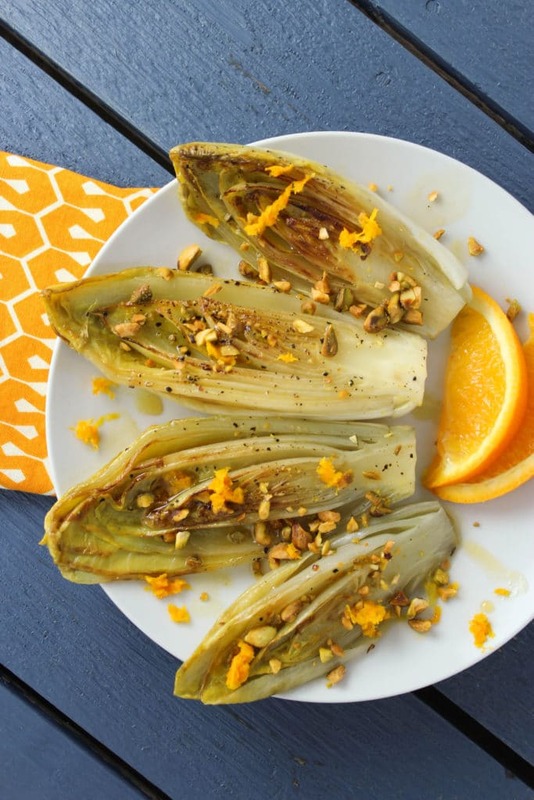 Decrease the heat to low and cook for 15 minutes, until endives become tender. When the white wine vinegar starts to reduce and look thicker, add the remaining orange juice and 1 tablespoon of honey. Stir to combine and bring to a boil. Continue stirring as the sauce thickens and becomes syrupy. 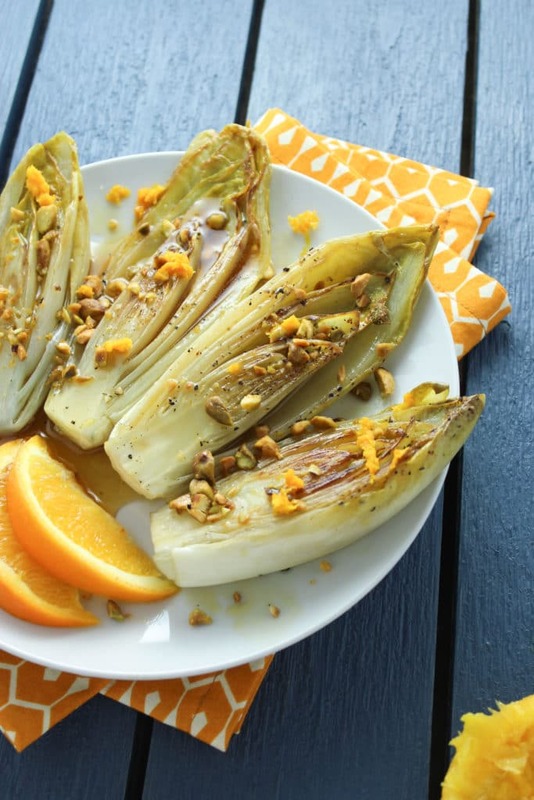 When the endives are tender and the sauce has thickened, remove from the heat and drizzle the endives with the sauce. Sprinkle with crushed pistachios, serve and enjoy!